Purpose of Use, such as Fish and Other Sea Food, Edible Meat, Vegetables, etc. Click here for a list of products. It is a universal slicer developed for multi-purposed processing of marine products and edible meat, while usability has been pursued. It is a simple and handy machine which is specialized only in cutting and is of space-saving type effective to be installed in a limited space, such as stores. Cutting in a horizontal direction that has conventionally been forced to be dependent on human power is mechanized. This contributes to reduced burden on an operator and improved productivity. It is suitable for use in processing valuable material without collapsing their original shapes. A rigid frame created with our unique technology is used to enable pressing of material into even thickness with the upper and lower conveyors without giving damage to material. 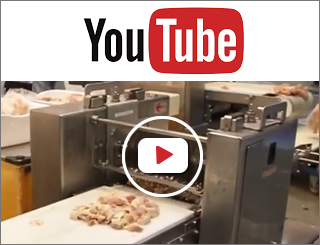 The machine realizes stable forming of ingredients of specified amount into meatballs, Hamburg steaks, chicken balls, fish balls, fish cakes, etc. Other machines specialized in cutting into particular shapes and materials, such as cutting fish heads and hog foot, are also developed. Reason Why ASAHI is selected. ASAHI provides a proposal for best setting, such as a combination of a machine and specifications best fit to the need of every user. Click here for more detailed concept. 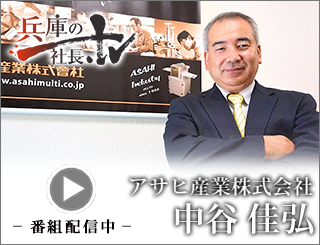 ASAHI, as a pioneer of processing edible meat and food in general, has been developing a wide variety of labor-saving machines with a sense of mission in order to contribute to labor-savings and diversification in food processing. It is our policy that cutting and arrangement of pitches and the like in accordance with the need of every user are determined upon detailed discussion with every user to deliver a machine after setting it as every user desires. Further, careful attention has been paid also to hygienic, labor-saving and maintenance phases, and Multilayered Blade Series has attained the accumulative sales performance of more than 1,500 units, since its introduction into the market. Noteworthy Models Compatible with HACCP! Parts brought in contact with material to be processed can be easily dismounted without using a tool. As a hygienic phase is considered as a top priority, a belt can be detached with a touch and easily washed. What’s New Click here for a list. Copyright © アサヒ産業株式会社 Asahi Industry Co.,Ltd. All right reserved.